The name 'Cicala Mvta' (pronounced Shikala Moota, Italian for a mute cicada) is a tribute to Soeda Azembo, the greatest street singer and songwriter of popular music in Japan, who was reduced to silence by the authorities after the 1920s. Led by clarinetist Wataru Ohkuma, one of the most innovative musicians in Japan today, Cicala Mvta are heirs to Soeda Azembo and have taken over the fight against the Japanese establishment. They develop music drawn from from chindon (street advertising music, the commercial medium before the advent of TV) and it's predecessor, Jinta (original Japanese brass band music, a form for anti-establishment expression). A mixture of old and new, east and west their music borrows openly from Klezmer, Turkish, Nepalese and Balkan music, progressive rock, punk, free jazz and folk to create it's own world. Colorful chindon groups used to be a common sight in Japan, marching in the streets noisily banging a chindon drum, while saxophones or clarinets would pick out the melody to the hits of the day.Ohkuma tramped the streets of Tokyo for 7 years playing clarinet as part of a spluttering tradition, until the late 80s when together with the group Compostella he started to revive chindon music by mixing it with other elements. While Japan is the only eastern country to have so readily absorbed western music, street performances of wind and percussion instruments can be found all over the world. 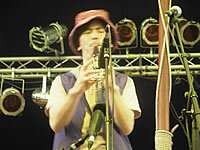 As an "unmilitarized" street music, chindon is related to Jewish Klezmer music, New Orleans brass bands and wind and percussion ensembles from China and south east Asia. Ohkuma is as keen to embrace these influences in the music of Cicala Mvta. "In my opinion, old jazz , klezmer or wedding brass band traditions, from India to the Balkans, are all similar to chindon as an early modern mixture music . These are all clarinet musics, so it's very natural for me to play these types together" he says. Ohkuma's other disparate influences help give Cicala Mvta their own distinctive sound. These he cites as progressive rock, punk, avant-garde jazz, early modern music (such as Bartok) and folk. 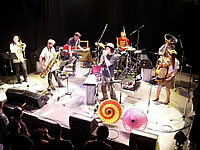 Only occasionally featuring the chindon drum, Ohkuma's perky clarinet is ably abetted by an unusual line-up of musicians, each bringing with them a sense of individuality to supplement Ohkuma's clarinet and saxophone, in what is a totally original line-up; fluid, distorted electric guitar, rip-roaring, booming tuba, frantic, discordant fiddle, and tinny, shuffling drums. Cicala Mvta are a truly dynamic live act, one of a handful of Japanese groups, to have created a 'buzz' in other countries. Their first overseas gig in 2000 was supporting Blur in London, afterwhich they toured for 6 weeks, playing to enthusiastic audiences at festivals throughout Europe. They have since been back to Europe several times.